There’s a company I love called Sambazon… you might have heard of them. They are a the producer of my favorite acai berry products drinks and smoothie packets! They have a storefronts and cafes in San Diego and Newport Beach, that I highly recommend if you are ever down there! At the cafe they serve these fantastic acai bowls. They also sell their smoothie packets in a lot of grocery stores nation wide and with those is how I make my acai bowls at home. Acai berries are a purplish berry from the Acai Palm Tree and are loaded with antioxidants and taste super yummy! Anything else you can imagine! Blend the smoothie packets, milk, cocoa, and chia in the blender until smooth, pour into a bowl, top with your favorite toppings, and enjoy!! 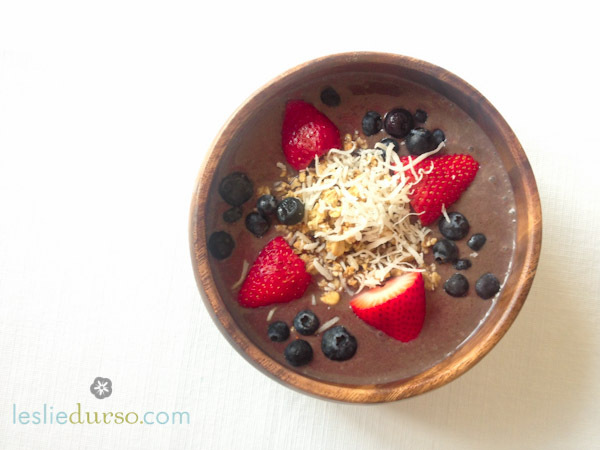 Acai bowls are the best and this recipe is great, but you can do much better than the Sambazon acai. I’ve eaten many acai bowls in Brazil, and for me the Sambazon stuff always seemed off with its flavor, texture and color. I’ve found a few brands here in the states that are better, but the one I’ve been happiest with is Amafruits. The Amafruits acai really seems as good or better than what I was accustomed to in Brazil. They don’t make acai juices, which are really just watered-down acai purees with added sugar, but they have the best frozen acai that I’ve found, which is critical to making a good acai bowl. Good Luck! Hi There, I disagree. I think Sambazon is a great (organic &vegan) company and I like the flavor. I’ve never been to Brazil, but I think it tastes great! I would love to try this recipe looks delicious! May I know where you get this bowl from? Hi Emily, They are vintage. They were my grandmothers.